Southern Mountain Mandolin is just one in an exciting series of 5 books exploring the music of the southern Appalachian region. Included in this series are Southern Mountain Banjo, Southern Mountain Dulcimer, Southern Mountain Fiddle, and Southern Mountain Guitar. Each book features vintage photos, history, instruction and music designed to accompany each instrument. 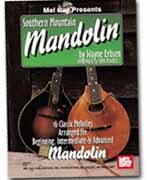 The Mandolin edition offers a great selection of tunes in notation and tab, and is a great way to learn and play Southern Mountain music.